Here is the in-kind sponsorship package that we are currently offering to conferences. Promotion for your conference in our blog and in social media, including Twitter, Facebook, LinkedIn, and Pinterest. We have a wide audience, and we can help you get the word out. Placement of your logo and link on the Two Scoops Press website. 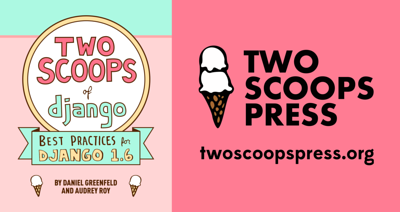 (Optional) 100-2000 Two Scoops Press stickers for your use as giveaways. (Optional) Special wholesale pricing and free international shipping for additional copies of Two Scoops of Django: Best Practices for Django 1.6, for your conference to sell at a profit. In return, simply place our small graphic with a link to twoscoopspress.org on your conference’s sponsorship page. Feel free to resize it to make it smaller/larger (see the media kit for more sizes). As past conference/large event organizers, we have actually found that more sponsor logos result in greater attendance and interest from sponsors, so this is to your conference’s benefit. Part of Two Scoops Press’ mission is to give back to the community whenever possible. We are a tiny publishing company with a tiny budget, so we can’t afford much yet, but we can afford to reinvest in the community through in-kind sponsorship. We have organized numerous conference-sized events in the past and even an actual conference, so we know that every little sponsorship offer makes a difference. We relate to and identify with conferences large and small around the world trying to promote the use of Django in their community. Send an email to conferences@twoscoopspress.org with your name, role (e.g. co-organizer), and a link to your conference website. Make sure that your conference website contains venue, ticket, and sponsor information. Two Scoops Press reserves the right to reject any applicant for any reason. Please confirm with us before you announce participation in this program. This program is only for conferences and events held in 2014.